Oh, look! 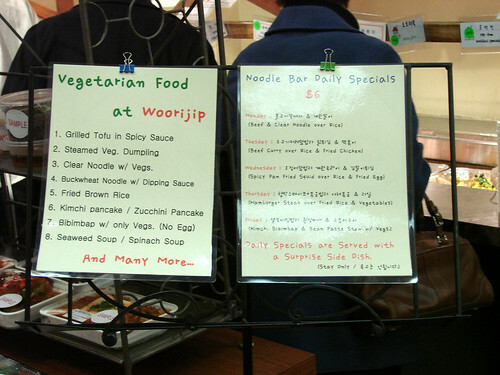 A sign explaining the vegetarian options. Excellent. Most excellent. 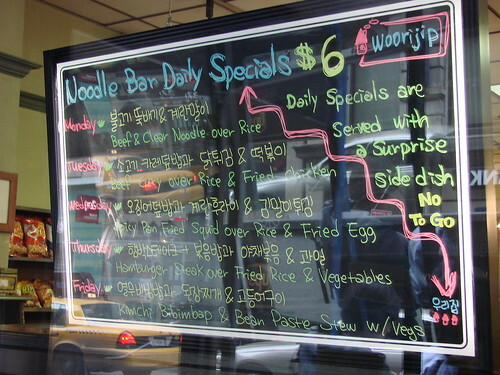 I also noticed Woorijip now has rotating week day daily specials at the Noodle Bar for $6. The specials are eat in only and feature a "surprise side dish." I like surprises. I like side dishes, too. And I really like the Noodle Bar. Unfortunately I seem to have a problem getting to the Noodle Bar when it is open. Which is actually pretty impressive considering that during the week it's only closed for one hour between 9:00am and 8:00pm. The Noodle Bar specials menu changes weekly, so check in at the beginning of the week and plan accordingly. I did take note that this Friday they are featuring the Kimchi and Bean Paste Stew again. This week when I failed to make it to the Noodle Bar, I had the chance to try the new vegetarian Kimchi Bibimbap lunch box from the refrigerator case. 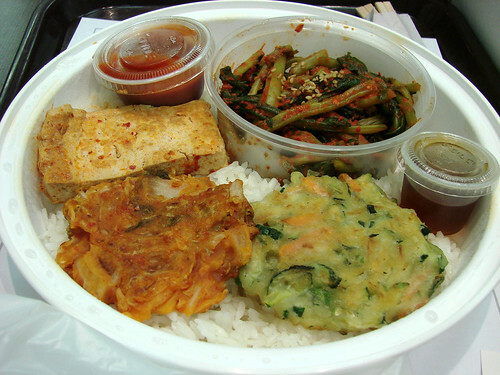 The Kimchi Bibimbap lunchbox comes with a miso soup and was an ample meal for $6. Another Woorijip fail...the non vegetarian sounding Pan Fried Pork and Kimchi. I say sounding, because the ratio of kimchi to pork was decidedly in the favor of the kimchi. I was deciding between the spicy pork over rice for $5 and this pan fried pork and kimchi for $6.50. On first glance the pan fried pork and kimchi looked like the better value. The container was heavier, no rice filler, a couple nice pieces of tofu on top. Looked like an awesome deal. My friend and I dug in right away and soon discovered that our awesome deal consisted of some nice pork slices on the top, but when you moved those slices it was pure kimchi underneath. Don't get me wrong, I love kimchi, but you can easily come up with plenty of better ways to spend $6.50 at Woorijip. They changed their cook a while back (within the past year or so); since then I noticed the decline in taste and quality of food; it's unfortunate. If you have time for a sit down lunch, you can get much better quality food for about the same price at Natural Tofu (also on 32nd St., a little further West, on the second floor) with a greater variety of vegetables, the free pan chan that is provided with every meal.